Whitby Town play twice in two days across a busy weekend with a Yorkshire derby on Boxing Day and a special Sunday afternoon approaching at the Turnbull Ground. The Blues visit West Yorkshire ex-colliery side Frickley Athletic before battling cup giant-killers Blyth Spartans 48 hours later. The Spartans game will also coincide with a legends reunion as many of the 1996-97 FA Vase and Northern League championship-winning squad take to the Turnbull. Current coach Dennis Wheeler and assistant manager Dave Campbell were both involved on May 10, 1997 when Town played within the famous twin towers. Campbell, the Blues’ long-serving goalkeeper, was determined to bring his old team-mates back together. “It’s something we probably don’t do enough”, he told the Whitby Gazette. “Quite a few are coming down, it’s going to be a really good turn out. As well as the former skipper, Blues fans can meet midfielder Kenny Goodrick, Ian Williams - who netted against Scarborough in the 2001-02 FA Cup fourth qualifying round - utility player Allan Martin, local lad and striker Mike Hall, plus defensive duo Lawrie Pearson and Mitch Cook. Two of Town’s Wembley scorers Andy Toman and Graeme Williams will also be on hand, alongside keeper Michael Williams. “They’re really keen to come down, to see each other and see all the fans as well,” Campbell added. “They’re all very approachable and I think they’d be overjoyed if people come up and ask how they’re doing and about the cup run. The Seasiders also reached the First Round of the FA Cup, earlier that season, drawing 0-0 with Hull City and leading them 4-3 with less than a minute remaining in the replay, before going down 8-4 after extra-time. A Northern League championship, promotion to the Northern Premier League and a 3-0 win over North Ferriby United in the Vase final, proved more than adequate consolation. Friday’s opponents Frickley have won six times at home, in the NPL, this season and in frontman Gavin Allott have a 12-goal threat capable of turning matches. Meanwhile, after seeing off Hartlepool United live on BBC Two, Spartans face a third round FA Cup tie with Birmingham City, a week on Saturday. Campbell remains confident, however, going into the long weekend. “I think they’ll be two good games, especially at home to Blyth,” he said. “Frickley are going to be physically a hard side to beat, they’ve improved from last season. Town drew 2-2 at Blyth in August, their first point of the season. Saturday’s star Steven Snaith, netted a brace, as Whitby came from behind to lead 2-1, before Robbie Dale pegged them back in the second half. “We probably should’ve won the game up there.” Campbell insists. “They’re not that different a team from when we played them, hopefully we’ll get a few through the gate and get the passion going. Further incentive was added for the Blyth game when major sponsor Ivor Homor of the Hart Inn, Sandsend pledged to donate £5 for each additional supporter once the crowd reaches 300. The Victoria Hotel have since agreed to match the offer, with any other interested party encouraged to call chairman Graham Manser on 07966 241344. One supporter donated their cash prize back to the club, in memory of another Wembley hero, Jimmy Mulvaney, who scored for the Seasiders in the final of the 1965 Amateur Cup. 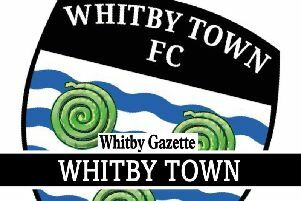 Town met Blyth for the first time that season and have won 41 to the Northumberland club’s 39 overall. Physio Paul Scott will make a late decision on whether former Spartan Lee Mason will be fit to face his former club. The winger is unlikely to feature at Frickley after re-injuring his groin during last week’s win over Stourbridge. Kick-off at the Turnbull Ground on Sunday (Dec 28) is 3pm with Under 18s again admitted for just £2 and Under 16s getting in free, when accompanied by a paying adult. Concessions pay £5 and adults £9, however there are ten-match tickets available for £65 and £30 - fans should contact Mr Manser before the Blyth game if they’re interested in the offer.